If guidebook writers even bother to mention Guatemala's Semuc Champey, they rarely offer more than a teaser. The cascading pools of turquoise and emerald are often looked over in favor of the many other places worth venturing on the Guatemalan map, among them the ruins of Tikal, the colonial city of Antigua and the volcano-ringed Lake Atitlán. I should know: I was an editor of one of those guidebooks. After reading the short description of Semuc Champey over (and over... and over...) something about it aroused my curiosity. So when I embarked on a 10-day trip from Guatemala City to Belize City, I made sure Semuc Champey was on the itinerary – even if it was a little out of the way. Now that I've been there and back, I can tell you it was well worth the extra effort and the few extra bumps in the road. Although it was technically in the opposite direction of our route, we had taken a short sojourn to Lake Atitlán for a night. That meant in order to get to Lanquín, the small town that acts as a jumping-off point for Semuc Champey, we would have to spend nearly an entire day in the car. After backtracking through the smoggy Guatemalan capital where we had landed a few days prior, our car endlessly wound up and up through the mountains. The trip would have likely taken half as long if we weren't forced to slow down every few hundred yards to drive over speed bumps, many of which seemed manmade by local villagers in order to force cars not to be so lead-footed when passing through. Just after dusk we passed through Cobán, the capital of the Alta Verapaz department, one of 22 departments that make up the country – similar to states or provinces. By that time it was dark – and raining – making the trip seem even more treacherous. As the city lights disappeared behind us, a thick layer of fog surrounded us ahead. In this part of Guatemala, a fine-misted rain falls from the sky constantly during the rainy season. Locals call it "chipi chipi." It seems as though everyone is quite used to the continuous rainfall; many people were walking and riding bikes along the side of the road. As someone unfamiliar with what lay beyond the pavement, my mind couldn't help but wonder where the people our headlights shined on lived and how often they had to make this trek during a downpour. Our driver, for one, seemed unfazed. The roads remained paved until about six miles before you reach Lanquín, when cars and buses take, quite literally, a downward spiral on a rocky road into the jungle. It's bumpy and overgrown, making the pesky speed bumps we had to travel over to get to this point seem like child's play. As we bounced down the road, I couldn't help but think this place would make the perfect setting for a horror movie. We made it to the tiny town of Lanquín and some locals helped direct us to our hostel, Zephyr Lodge. We checked in just as the nightly party hit its crescendo. For better or for worse we joined in, knowing that we had to get up bright and early to stay on schedule and get to Semuc Champey. The next morning things started off a little rocky. It seemed our travels weren't quite over: we still needed to spend a half hour standing with a bunch of other hostel-goers in the back of a pickup truck as it climbed at near-impossible angles up dirt roads to Semuc Champey National Park. Before we set off, our tour guide made a pit stop in town to get candles, an important part of the first adventure at this park – exploring a cave by candlelight. Not long ago I had "explored" Luray Caverns in Virginia, where visitors walk on manmade pathways through several well-lit chambers. I knew the cave near Semuc Champey would probably not be such an easygoing, accessible experience, but I wasn't expecting the serious challenge that lay ahead. Outside of the entrance to the cave, our guide instructed us to strip to our skivvies and leave our cameras behind, as we would be climbing and swimming through multiple underground chambers. The guide, who wore a headlamp and board shorts, didn't say much else, but handed us each a lit candle as we entered the cave. We were the first group to walk into the cave that morning. As we entered the first chamber, a few bats took the opportunity to leave, flapping their wings over our heads. As I watched the entrance to the cave disappear behind us, it became clear that the candles would be the only thing keeping us from being enveloped in total darkness. What started as an easy hike through the cave soon turned into some difficult maneuvering. Not only did we scale walls and climb up and over waterfalls, but at some points we needed to hold our candle above our head with one arm and use the other to swim through dark waters where our feet no longer touched the ground. We moved through the cave until reaching a waterfall that some daring people climbed and jumped off of. Our guide took a final leap into the water, and to our surprise, didn't surface. At first some of us giggled, but after awhile we started looking at each other nervously. Was he just playing a joke? If he was, how long could he possibly stay under water? Just as someone stepped forward to jump into the dark pool of water to rescue him, we heard a scream behind us. It was our guide, who seemingly knew about some sort of underground tunnel and played this joke whenever he took visitors on tours. I was relieved, but as we turned back I felt a little daunted at the prospect of going back through the cave – which seemed more like an obstacle course. In the end, I was happy our guide had not briefed us on any further details before we entered the cave. Otherwise, I probably would have let all the others go ahead while I waited outside. Instead, the group mentality pushed me to continue no matter how challenging the task or how claustrophobic I felt. And let me tell you: finally seeing the outside light filter through the cave was a great feeling. It had only been a little over an hour, but it seemed like we had been underground for much longer. Little did I know, this was only the first obstacle we would face. So what is Semuc Champey, exactly? It takes a steep climb to a lookout to find out. Our guide (smartly) told us to follow the path up, enjoy our lunch at the lookout, and then meet him at the bottom. A few minutes into the climb – which, by the way, is labeled "difficult" on a signpost – we were out or breath and cursing his name. But we forged ahead until finally reaching a wooden overhang on the side of a mountain. From the edge, you could see it: a river cuts through a dense forest, but instead of running water there is a 300-meter-long limestone overpass made up of a series of pools. These baths are filled with runoff from the Río Cahabón, and many are connected to one another by small waterfalls. The river here flows under the limestone bridge and emerges downstream. We ate our lunches in silence, staring blankly at the beauty in front of us. After we climbed back down (this time, there were stairs! ), we reached the placid pools of cool water. The day's challenges were well worth the reward, and we spent the next few hours splashing around in the cool, clear waters. Our guide showed us some spots where waterfalls formed natural slides, and also some great jumping-off points. It was kind of like a water park, except minus the crowds and concrete. When it came time to leave, none of us wanted to stop enjoying the sunshine – but our stomachs were grumbling and our ride was leaving, so off we went. Although it is far from being overrun with tourists, I should note that travelers do go to Semuc Champey. Usually the ones who are moving slowly, spreading their experience out over weeks or even months and saving money by renting beds at hostels. They are also usually in good health, and are more than willing to climb the grueling 20-minute hike and go caving by candlelight. Of course, these are just generalizations – but they also give clues as to why Semuc Champey has remained more remote than other destinations throughout the country. Photo credits: top photo by Kacy McAllister; additional photos by Libby Zay. 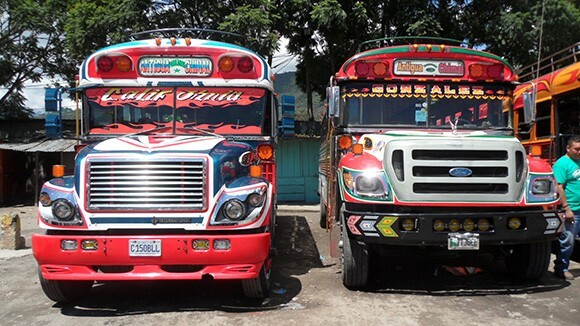 When weathered school buses are retired from commission in the United States, they don't always end up being scrapped: many times, they find a new life (and a new paint job) in Guatemala and other Central American countries. Known to English speakers as "chicken buses" because of the likelihood travelers might find themselves sitting next to livestock, these buses can be found throughout the country and are often filled to the brim with locals, budget travelers, and goods. Across the world, many modes of transport seem unique to those of us using them for the first time — and these buses are no exception. An excursion in one of these vehicles can be chalked up to an amusement park ride, complete with the motion sickness that comes with a driver racing around curves at seemingly impossible speeds. The inside is as animated as the wild colors painted on the exterior, with people entering from both the front and back doors and vendors hopping on and off to try and sell ice cream, plantain chips, and other goodies. Benches intended for two schoolchildren are crammed with three (or more) people, with others standing in the aisles and sometimes even riding on the roof. Most entertaining, however, is the bus driver's right-hand man, the ayudante. This helper keeps track of all the bodies on the bus, ensuring everyone pays a proper fare, organizing suitcases, and calling out the names of stops to people on the roadside. Keep a close eye on this guy, as he often finds the most opportune moments — such as when a bus is tearing around a harsh curve — to climb out the window and onto the top of the vehicle to secure packages. It's true that these buses aren't for the squeamish, but it's the cheapest way to get from place-to-place and offers an invaluable look at Guatemalan culture.